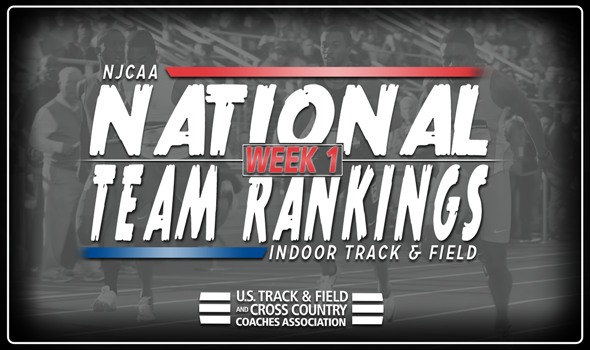 NEW ORLEANS –It’s certainly early in the season, but for the first time since 2015, we have a new leader on the men’s side of the NJCAA Indoor Track & Field National Team Rankings. While Iowa Central CC’s women are holding down the fort atop the women’s rankings to open the season, the men sit in second after coming in ranked first every week across the last two seasons, announced the U.S. Track and Field and Cross Country Coaches Association (USTFCCCA) on Wednesday. Barton (Kan.) CC is the current front runner in the men’s rankings after a very strong start to the season. Barton (Kan.) CC earned its first No. 1 ranking in program history by owning 26 top-10 Descending Order List spots so far this season. Two of those spots are tops in their respective events: Dartez Hamlin’s 200 time of 21.32 and Sanjae Lawrence’s shot put mark of 18.39m (60-4). Iowa Central CC found itself in relatively unfamiliar territory by coming in second this week despite having the NJCAA leaders in the 60 hurdles (Malik Beverly) and weight throw (Travis Peterson). Rounding out the top-five is Coffeyville (Kan.) CC, Meridian (Miss.) CC and Cloud Country (Kan.) CC. The rankings for Coffeyville (third) and Meridian (fourth) are program bests. Coffeyville (Kan.) CC has benefitted from having the top athletes on the NJCAA Descending Order Lists in the 400 meters (Jermaine Holt) and the triple jump (Dodley Thermitus). Meridian (Miss.) CC’s 4×400 relay squad also sits atop the NJCAA Descending Order List. Cloud County (Kan.) CC has four top-three marks on the Descending Order List so far this season. There’s no surprise that Iowa Central CC is the leader heading into the first week of rankings. The squad owns six top marks on the NJCAA Descending Order List. Agnes Mansaray (600 and 800 ) and Adva Cohen (mile, 3000 and 5000) own multiple marks, while Michelle Tomlin (weight throw) is also the best in her event. Reigning national champion New Mexico JC is the runner-up in the rankings thanks to 10 top-five Descending Order List marks. Barton (Kan.) CC, Monroe (N.Y.) and Central Arizona are third, fourth and fifth, respectively, in this week’s rankings. Barton (Kan.) CC benefits from having Keosha Sanders in the 60 meters, Latoya Stewart in the 400 and Amanda Carty in the triple jump on its roster, as all three sit atop the Descending Order List in their respective events. The Barton (Kan.) CC 4×400 relay is also tops in the nation this year. Dawnel Collymore of Monroe (N.Y.) owns the best 1000 meter mark in NJCAA this year, while Central Arizona has two women on its roster who lead the NJCAA in their respective events: Josephine Anokye (200 meters) and Cherrise Murray (shot put).